This is the perfect vacation house for the family or groups! Get away from the frantic city life and come enjoy the quiet relaxing country life and fresh air! Go jogging, walking in the woods, or hiking with your boots on! 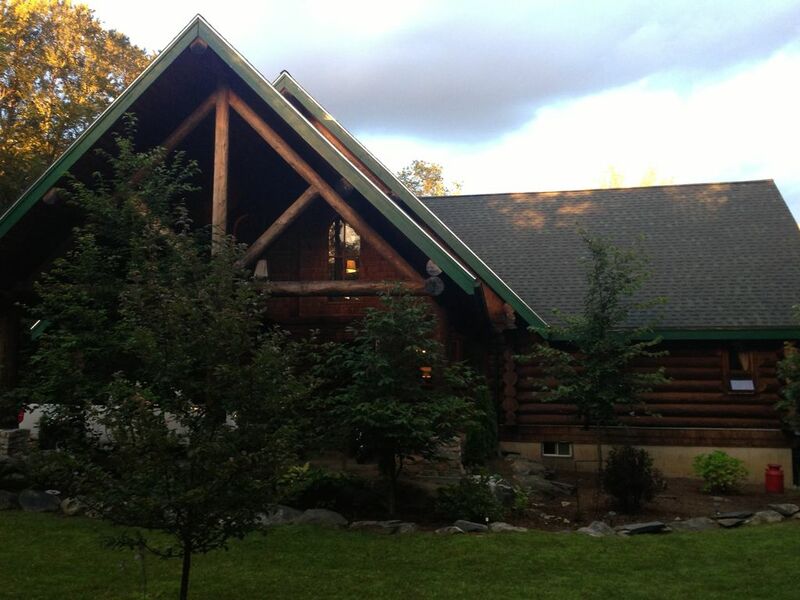 The property is 6500 square foot, 3 story cabin with a 1000 square foot deck with a spa over looking the woods. The house has a full gourmet kitchen and a second kitchen that comes complete with a bar. There are 5 bedrooms and 4 bathrooms. The great room fettering a 30 foot high ceiling and a stone fireplace. And comes with a beautiful pool table! A get away and near my family. This is a real log cabin that i designed and built. one resturant stove, a standard gas stove and a stove top. Dino's cabin in Essex is the perfect getaway from the ordinary. The pictures in the profile do not do justice to this gorgeous, sprawling cabin retreat in the woods. Upon entering we took about 30 minutes just to go through every room and space in the home as there is so much space on 3 levels. The furnishings and art throughout the home are beautiful and really add a bonus element to the stay. There was a lot of thought put into the design and entertainment that made it possible to arrive and stay at the cabin and not have to leave for the entire weekend. Our group of 7 had plenty of room to spread out and enjoy the amenities. The cabin also came with every convenience of home. Dino is a great host and was responsive to all our inquiries and provided excellent suggestions for local entertainment and transportation. Our group is already discussing a future stay at the cabin. I would strongly recommend staying with Dino as this is truly a one of a kind property! The cabin was close to Burlington, about a 25 minute drive. It was very beautiful and big with something for everyone! We really enjoyed the fireplace, heated floors, light from big windows throughout and the game room downstairs. There is so much space, perfect for a big group. We had 6 people in our group and still had plenty of room for more. Dino, the cabin owner, was very responsive and easy to reach whenever we had a question. We would definitely come back to a beautiful home like this, it had a perfect Vermont feel. One of us forgot our wallet and Dino's house keeper found it and he will be mailing it to us which shows how reliable and honest they are. My wife and I took our 3 adult kids (mid 20's) and their significant others away for a weekend in January, just to spend some family time together. It was perfect and Dino was great to work with. If I could give it 100 stars, I would!!!! This cabin is a GEM. It is a real log cabin with a rustic, VT feel yet it has all of the amenities and comfort of a luxury stay. Beautiful high ceilings, two giant fireplaces, extremely large deck with bar, outdoor jacuzzi, wet bar, pool table, air hockey table, projector screen, large king beds, piano, beautiful furniture and decor, and the list goes on. The house has everything that you need AND MORE. Made for parties and a great time. Tons of interesting antique items make this house truly unique. We loved playing records and listening to a great vinyl collection in surround sound. Not far from Stowe and other mountains/activities. In addition, the host is not your typical host. Aside from being a genuinely nice person, he was flexible, accommodating, and truly wanted our group to enjoy all that the house had to offer. We were stuck in a snow storm and he was constantly available to make sure we were safe, answer our questions, and also just to point out little highlights of how to best enjoy the snow such as where the best mugs for hot chocolate were located and which outdoor lights to turn on for the best view - this is far from standard. A superior property, a superior host, I will stay here again and again and would recommend to others for families, girls weekend, bachelor parties, etc. It's so good, I almost don't want to spread the word to others and keep it all to myself. Thank you for everything, Dino ... looking forward to many more trips at this amazing cabin!!!!! Amazing Huge log cabin with every amenity. Easily fit our group of 9 around the table with room for more. Extremely nicely decorated with interesting items throughout the home. Big comfortable beds and furniture. The owner Dino could not of been more helpful. Was very fast to respond if we had any questions. A trip that will live in our familys memory for a lifetime. Already talk amongst them about when we can return. Thank you Dino for your hospitality and for sharing your beautiful home. Based on the pictures and description, I had pretty high expectations for this rental. That being said, the house exceeded all of my expectations. The house was enormous and beautiful. Equally important to me was that it was well maintained and extremely clean. Dino (the owner) reached out in advance and while we were there to make sure we had everything we needed and that everything was perfect (we did and it was). It was a great stay and we would certainly stay there again.